Several passers-by have commented on the owl lately, and I’ve mentioned to them that the backstory is on this blog. Rather than make them hunt through several layers of old posts I’ll put the short(er) version here. During one of my periodic garden expansions (10 years ago now!) I cut down some young spruce near the road and left one of the trunks to use as a birdhouse support. The next day one of my neighbors anonymously perched a plastic owl statue – commonly sold in hardware stores to keep birds away from your raspberry bushes and seagulls off your dock – on the tree stump. The next day someone else had dressed the owl in a child’s dress and sunglasses, and a tradition had been launched. 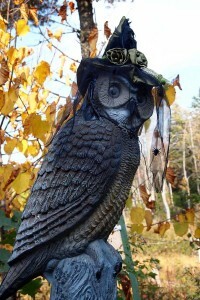 When my son graduated from high school the owl had a tiny mortarboard (where did they get that? ), and from Memorial Day to the Fourth of July it always sports bunting and tiny flags. One year for Halloween it had a pirate costume with a tiny bird perched on one shoulder. Last week this lovely witches hat showed up by our front door with a note asking that I trim the brambles back so that costuming would be a little easier. The hat has plastic spiders on the veil – how could I resist? Oh, and the name. . . growing up in a small town I’ve never been very fond of the social capital concept. To me it is a professional nostalgia that emphasizes the value of social networks while glossing over the cruelty and restrictions that represent the darker side of the extended family group. The owl and its anonymously donated wardrobe represent the finest kind of neighborhood organization, with nothing at all at stake and the only benefit our communal delight. This entry was posted in Uncategorized on October 7, 2012 by APo.